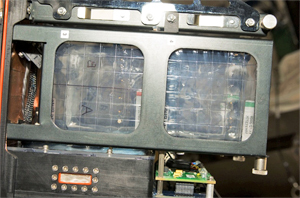 CSS designed, fabricated and tested NASA's Advanced Biological Research System (ABRS), potentially used as a primary research facility to conduct biological experiments in microgravity, or as a specimen transport device to and from the International Space Station (ISS). The ABRS may be used to grow plants, microorganisms and small arthropods. It has dual chambers that can independently provide atmospheric contaminant scrubbing; temperature, illumination, carbon dioxide, and relative humidity controls; generic chamber imaging from three cameras; and power supplies. It also provides data services for a variety of experiment-unique equipment, including a Green Fluorescent Protein (GFP) imager that may be mounted inside the chambers. ABRS was transported to the ISS as an element of the last Space Shuttle Mission: STS 135.